Rubio and Sanders win narrow leads among urban voters but lose them outside metropolitan areas. 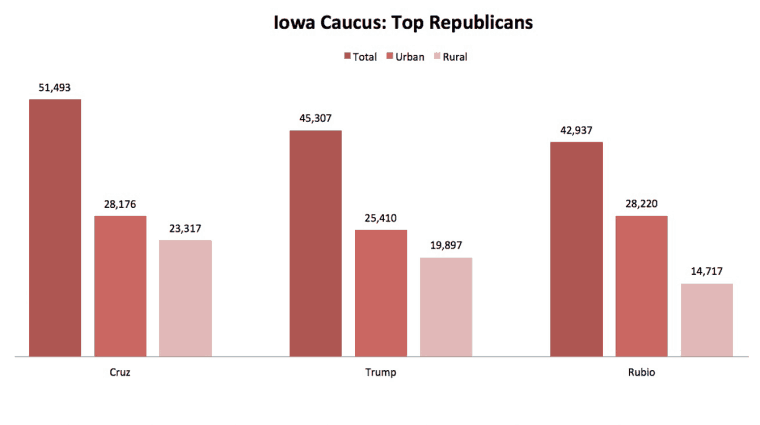 Trump finishes third in urban areas and second in rural. Republican caucus results captured at approximately 12:45 a.m., February 2, 2016, with 99.9% reporting. Iowa’s rural Republican caucus-goers favored Ted Cruz in yesterday’s contest, helping give the Texas senator a statewide lead in the first race of the 2016 primary season. 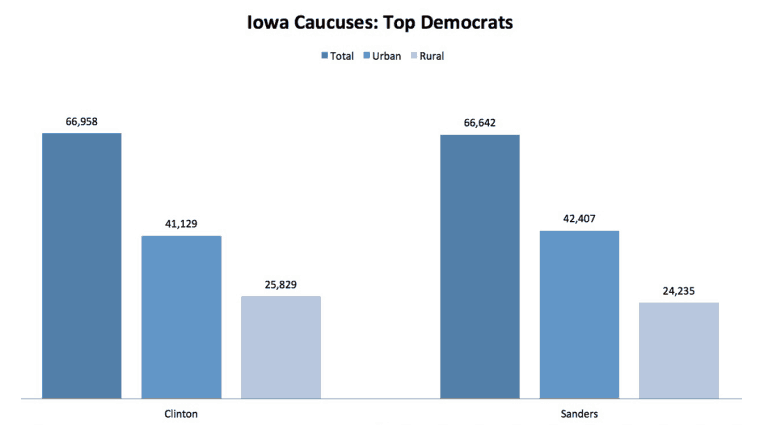 On the Democratic side of the race, Hillary Clinton proved slightly more popular among rural caucus-goers. Her 3-point lead over Vermont Senator Bernie Sanders in rural was just enough to give the former secretary of state a slim statewide advantage. Democratic caucus results captured at approximately 12:45 a.m., February 2, 2016, with 96.8% reporting. In the Democratic contest, caucus support is used to calculate delegates. Democratic results are released officially as State Delegate Equivalents (SDEs). This analysis is based on an earlier report on the raw count of supporters via Politico.com. Donald Trump, the Republican candidate who loudly and wrongly predicted victory in the Iowa contest, finished second overall. He came in third among urban caucus-goers behind Cruz and Florida Senator Marco Rubio. He finished second behind Cruz in rural areas. Cruz and Rubio ran a virtual dead heat among urban caucus goers. But Cruz over-performed in rural areas. He got 55% of his caucus support in rural counties, while Rubio received only 24% of his support from rural. Trump got 44% of his support from rural areas. Statewide, rural participants made up 41% of the Republican turnout. For Democrats, Clinton’s and Sander’s performances were virtually even in urban and rural. Statewide, Clinton received support from about 300 more caucus-goers than Sanders. Clinton outperformed Sanders by about 1,600 supporters in rural counties. Sanders had an advantage of about 1,300 supporters in urban areas. Sanders performed best in counties that Barack Obama won in the 2012 presidential election. Sanders won 20 of the 38 Obama counties. He also won eight of the 10 counties with the highest percentage of Democratic voters. Seven of those counties – including the two that Clinton won – are rural. In the 2008 Iowa race, Clinton finished third behind Obama and Senator John Edwards. After Iowa, however, her support from rural voters helped keep the Democratic nomination uncertain until late in the 2008 primary season. The Daily Yonder also examined county-wide average individual income for patterns among voters. The average individual income of counties that Rubio won was highest of the three top candidates, at $46,562. Cruz was next at an average of $44,732. Counties that went for Trump had the lowest average level of individual income at $42,773. On the Democratic side, counties that Clinton won had an average total individual income of $46,062; Sanders’ counties had $43,925. How we defined rural: This story uses the Office of Management and Budget metropolitan statistical area (MSA) to define urban and rural areas. In this story, rural counties are those that are nonmetropolitan, or not located in an MSA. Learn more about various ways rural is defined.